Canvas Tool bag- (without tools). 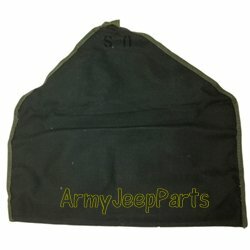 These NOS bags are used in almost all military jeeps. Have the correct metal spring steel reinforcement in inside edge. This design goes back to WWII. Very nice finishing touch for your restored jeep. No need to purchase a repro.